THIS is probably the best quote from him I've ever heard! How nice - knocking religious people again (so trendy and unoriginal). Its all about faith - you either have it or you don't. Reading CS Lewis might help you get IT. That was great! Funny because it's true! Love this quote. Very accurate. @ Argie & Mr. Fascination - I have faith, but I still see the truth, and humor in these words. I'm not sure why the "faithful" have absolutely no sense of humour. It wasn't a slag, it was a simple observation of human nature. In the quote, "them" refers to people in general, not just religious people. Guys like George Carlin and Seth MacFarlane have always made their dislike of anything to do with God or religion. In the movie Ted, Seth MacFarlane goes out of his way many times (even when the scene had nothing to do with it) to mock christianity... If he would have taken even a third of the shots he took at Christianity in that movie and directed it towards Islam, his life would have been in danger. Yes I believe that it's important to be able to laugh at yourself.. However when you cross the line of insulting someone's beliefs or what they hold close to them, then you cross the line. It just seems declaring yourself an athirst or mocking people who believe in God is the current thing to do. Because of political correctness, everything else is off limits (i.e. gays, race, women and some other "special" religions) as MrFascination noted, its still okay to mock believers or more specifically Christians. 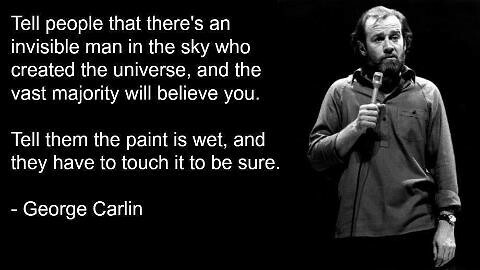 I happen to think Carlin and MacFarlane are funny - I just wish more people had the stones to mock the special victim groups who have this untouchable label. IN other words, it would be nice to see more consistency when it comes to people mocking an identifiable group. That's all. I wouldn't say it's "the current thing to do." It's that people who prefer to think for themselves aren't scared of the church anymore and are more open about their personal beliefs. The current climate is sort of a backlash against millennia of being told "Be quiet and don't ask questions." Also, it goes both ways. I went to a church service with my girlfriend recently, and the preacher was a downright prick about non-believers, spending a good 20 minutes telling his flock how we're all rotten, soulless people. Those people listening take it for truth, and go on with their lives thinking we're no good.